The popularity of Christmas scent diffusers has sky-rocketed in recent years. Reed diffusers, on average, last longer than candles. They also offer more control over the intensity of your home fragrance – simply add or remove some of the reeds. They're an ideal Christmas gift for those who like to have their home fragranced constantly, which isn't possible with a candle. And with so many coming in lovely, luxurious packaging, reed diffusers can make quite a statement in the home. Follow our guide to this festive season's best diffusers, from classic Christmas scents to more unusual options. Love a lovely home scent year round? Check out our best reed diffusers with a non-festive aroma. And why not explore the Real Homes top 50 Christmas gifts, handpicked by our team? Floral fragrances can be a little jarring in winter, but there is a way to incorporate a floral-based fragrance into your Christmas set up: choose one that has cassis or berry notes, like Dyptique's genius Baies. The result is fresh and a little tart, and perfect for crisp, chilly days. Our favourite is the strikingly packaged Flower Lady reed diffuser by Chase and Wonder. With notes of rose petals, cassis, and galbanum (that sharp 'green' note that prevents everything from becoming overly sweet), it is well balanced and certain to please. There is something infinitely uplifting about the smell of sweet, slightly boozy plums, and fruity scents are a great Christmas scent alternative for those who don't like spices/amber. Our favourite is the bestselling Rosso Nobile by Dr Vranjes – a sweet and tangy scent combining plum, raspberries and forest fruit, it smells exactly as you'd imagine by looking at its deep, velvety red colour. Pure wellbeing in a bottle. Available at Fortnum & Mason. Tom Dixon's candles and reed diffusers have a winning combination of unusual scents and sleek, shiny packaging that will fit right into a modern design scheme. The reed diffusers look and feel substantial and come in expensive-looking metallic jars – a perfect Christmas gift. We like the London diffuser; it smells green and a little salty, with some floral sweetness, just like London in spring. An unusual choice for Christmas, but a welcome respite from heavier fragrances. Available at Amara. Fans of Scandi design and the cosiness and conviviality evoked by hygge will love this scent diffuser by Skandinavisk. A light and unobtrusive fragrance with notes of tea, strawberry, and wild mint, it will complement a minimalist or Scandi Christmas design scheme. The Hygge diffuser is available at Nest. Pomegranate is a naturally complex scent – tart and dark – and requires little as an accompaniment. The Pomegranate Reed Diffuser by Sophie Allport is pomegranate as it should be – fresh, sharp, and with that element of je ne sais quoi that makes is so special. Sweetness and spice... you know how it goes. Nothing beats a classic spicy, wintry blend for a Christmas fragrance. 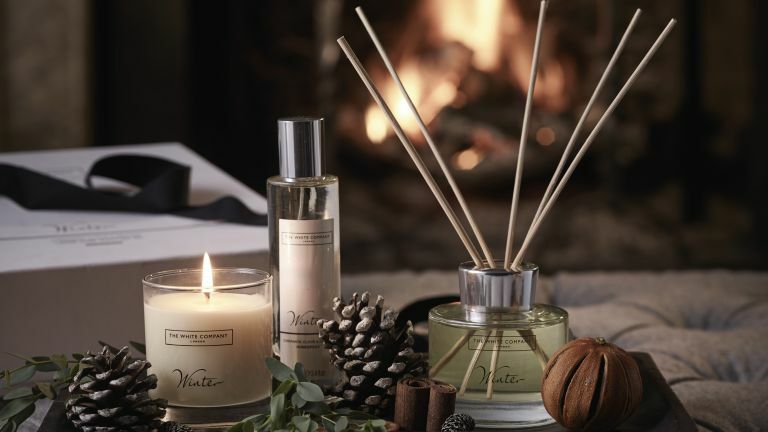 The Winter Collection by The White Company is the crème de la crème of classic winter home scents, and looks great, too. Fig fragrances are utterly distinctive and grown-up; the fig scent note is also very versatile, working easily with floral, woody, and smoky notes. There are green fig scents, dark fig scents, and understated fig/cedar combinations. Our pick of the bunch is the sophisticated Fig and Smoked Oak diffuser by Sainsbury's Home. Artificial Christmas tree? Create an illusion of the festive piny fragrance with a reed diffuser. A note of caution if you have pets (especially a cat): pine-based scents can be harmful to animals if used over long periods of time. You can still use your diffuser, but try keeping it in a room your pet doesn't spend much time in, or consider putting it away while you're out. Our pick is the Blue Spruce & Frosted Pine by The National Trust. We love the scent of berries around Christmas – tangy and sweet, it cuts right through the heavier smells of Christmas dinner and spices. We love the Winter Berries reed diffuser by Beefayre. Not only does it smell nice, but it's infused into natural oil, sans alcohol. Available at Annabel James. What Christmas is complete without a glass of fizz? Enjoy the festive scent of prosecco with the Limited Edition Festive Prosecco Fizz Fragranced Reed Diffuser by Baylis and Harding; the delightful, Christmas-tree-ready packaging is a nice bonus, too. Almost any dark fruit scent works for Christmas – throw in some ginger, and, hey presto, you've got a yummy, festive concoction. River Island have outdone themselves with the very pleasant Plum & Ginger diffuser; with fruity, sweet, and spicy notes, it's a firm Christmas favourite with us. The gorgeous purple glass packaging is a bonus. Eucalyptus is a popular herbal fragrance choice for winter and Christmas, but on its own, it can smell a tad medicinal. The Inspire diffuser by the Harrogate Candle Company offers a cheerful and sparkling take on this winter herb by blending it with exotic orange blossom and clean-smelling geranium. Perfect for frosty mornings around Christmas. Fortnum & Mason have been making great, traditional tea for a long time, so they have had real expertise to draw on while designing this delicious Christmas home fragrance special. With rich notes of tea, Christmas spices, and clementines, the Christmas Tea Diffuser is a real crowd pleaser or a fragrance, and perfect as a gift, too.